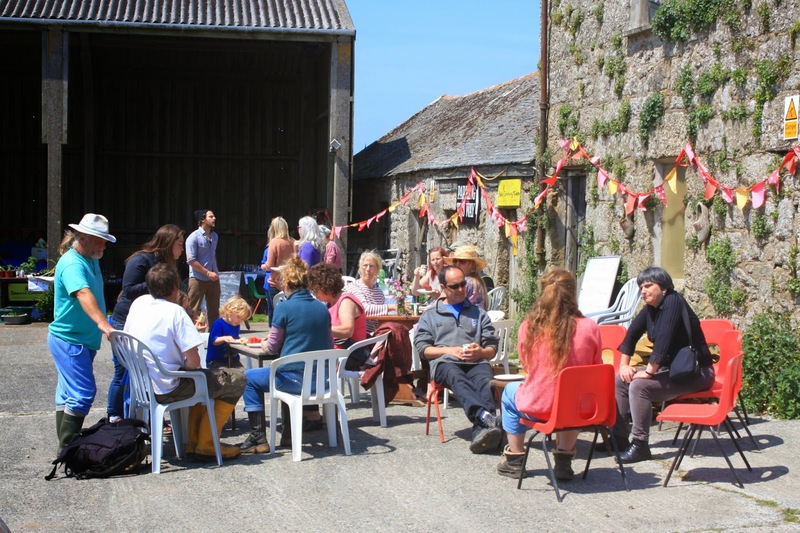 A big thank you from all at the farm to Helene, from France, for her two weeks volunteering, and all the best with her onward wwoofing experiences. 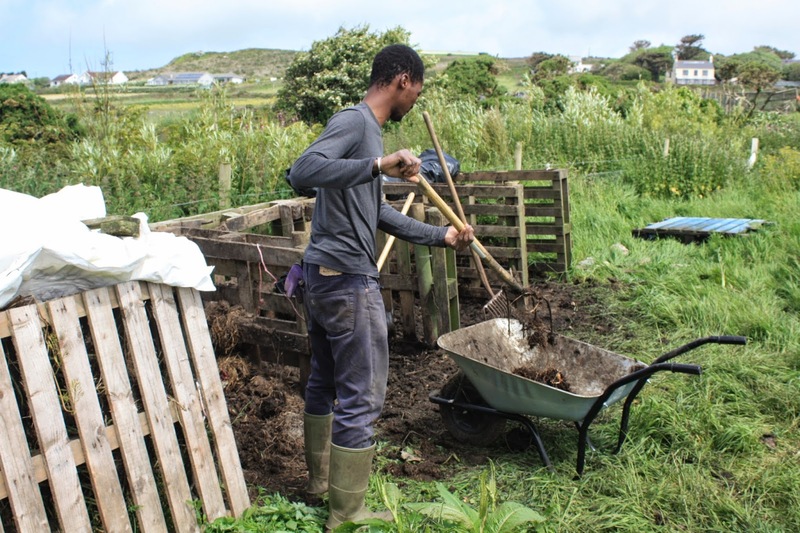 Also many thanks to Karim, from France, who cycled off to Newquay en route to his next wwoof experience today - happy travels and continued organic farming! Karim wheelbarrowing our compost onto the market garden. 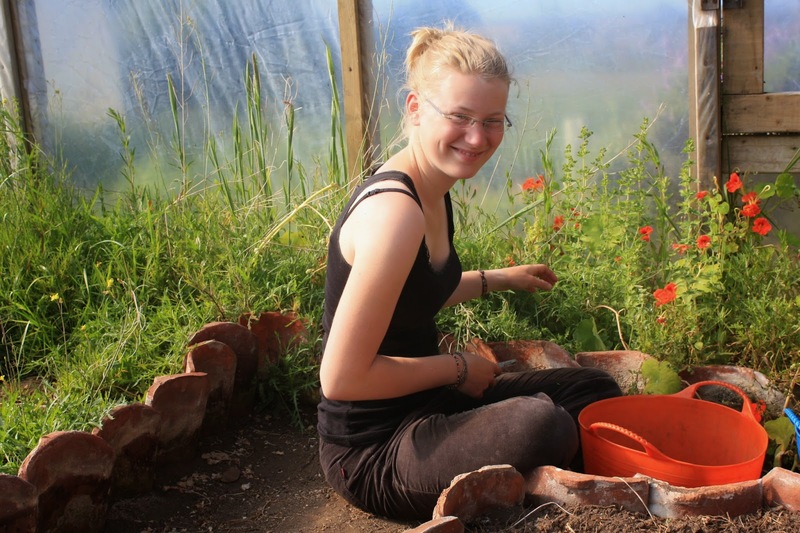 Many thanks to Katya, from Berlin, who left yesterday after three weeks wwoofing on the farm. Thanks for all your hard work and patience! Katya harvesting wild rocket and nasturtium flowers in the Mothership. Better late than never - yesterday we sowed a 45m row of runner beans, both White Emergo and Enorma. We usually sow them around the beginning of May, so are 5 weeks late this year, but we're confident of a good crop albeit a few weeks delayed. 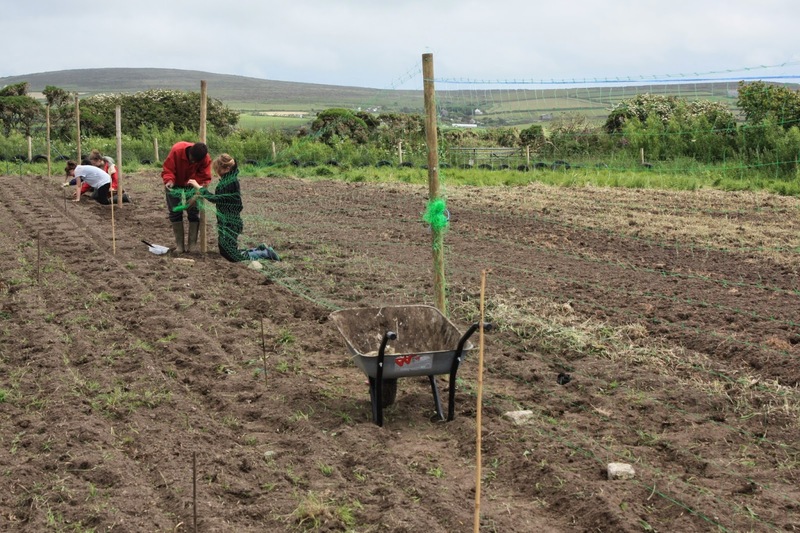 This year we are growing them up plastic mesh for the first time, to save the time of placing hundreds of canes (last year lots of our canes blew down in the strong winds despite being well tethered) and for ease of weeding. 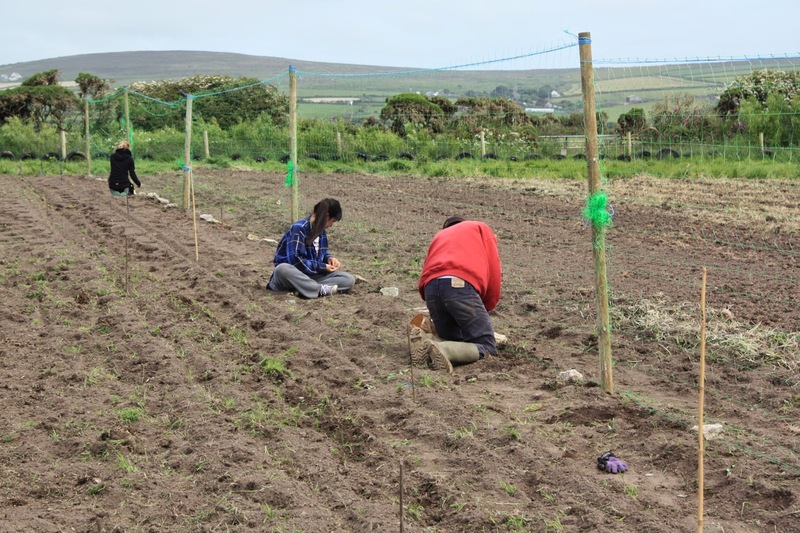 Isobel, Matilda and Jenny giving the final weed, while Karim and Eva erect the mesh. 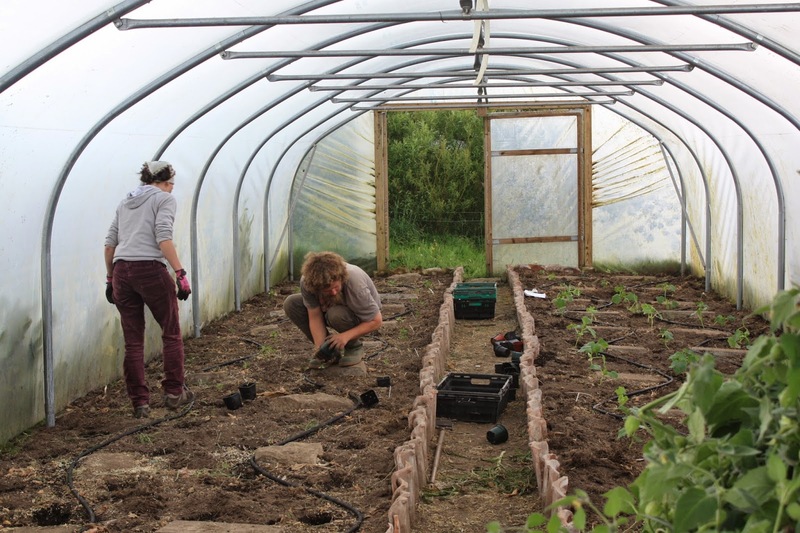 Eva, Jenny and Karim sowing the runner beans - the quickest part of the operation. 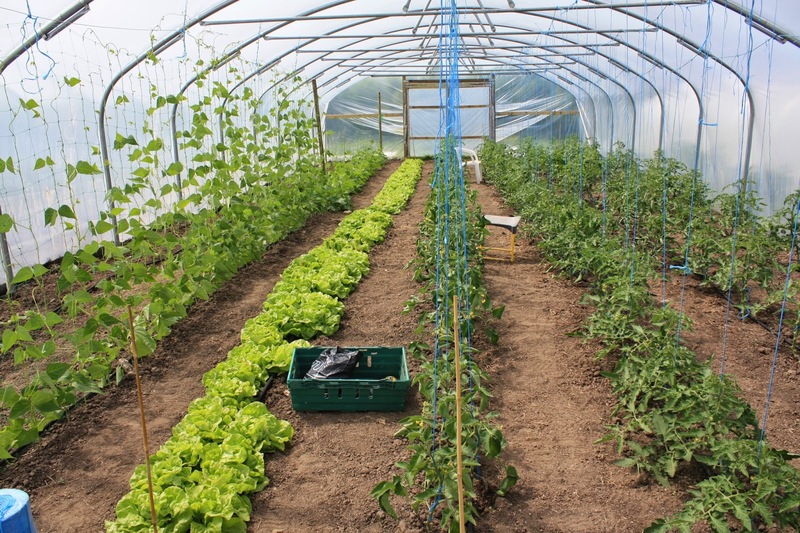 .........with a line of aubergine seedlings, a mesh of two varieties of climbing French beans, a line of May Queen lettuces now ready for picking, and 4 lines of tomatoes just beginning to set their first fruit. 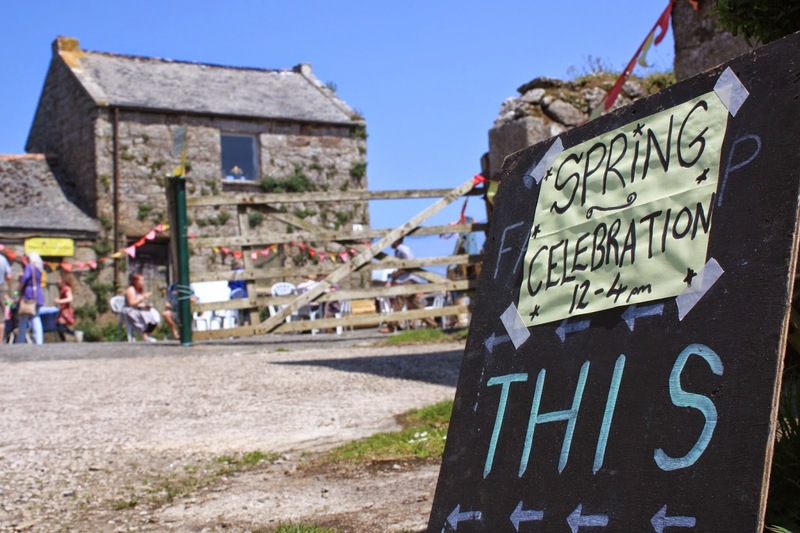 Saturday 31st May saw Bosavern Community Farm celebrating spring with a fun-filled event on a lovely sunny afternoon. 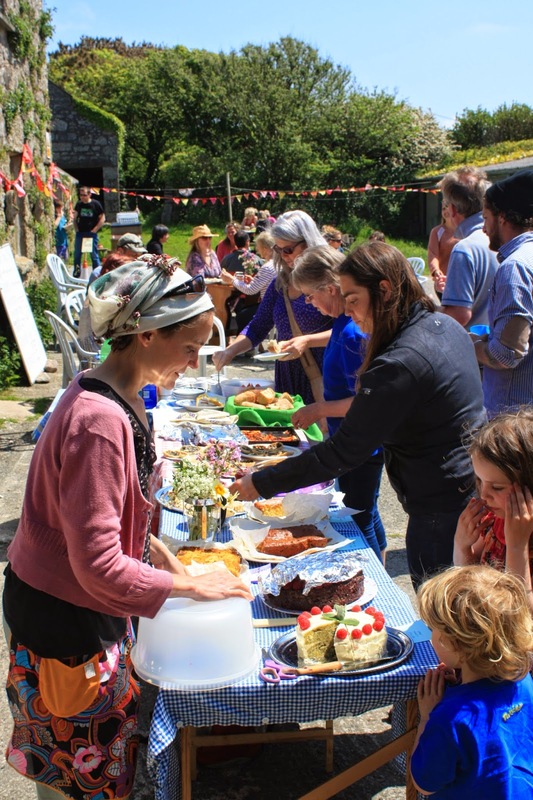 There was a typical array of home-made goodies in the open-air cafe (huge thanks to all who baked and contributed), a seedling swap, face-painting, a treasure hunt, silly games for all the family, decorating flower-pots and sowing sunflowers, and informal walks around the farm. Delicious cakes and savouries in the farmyard cafe. Enjoying the sunshine and coffee. 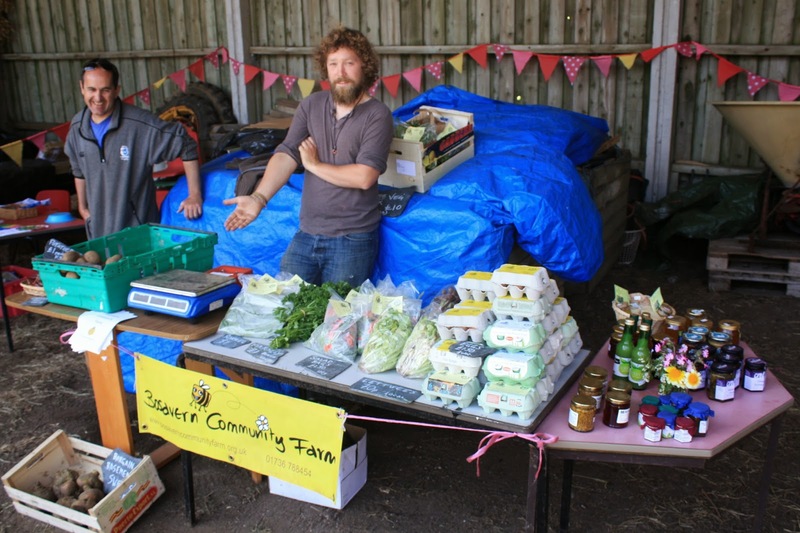 Martin and Pete running the farm produce stall. We'd like to thank everyone who helped organise and run this latest in our tradition of successful community events. How to fill a sausage. 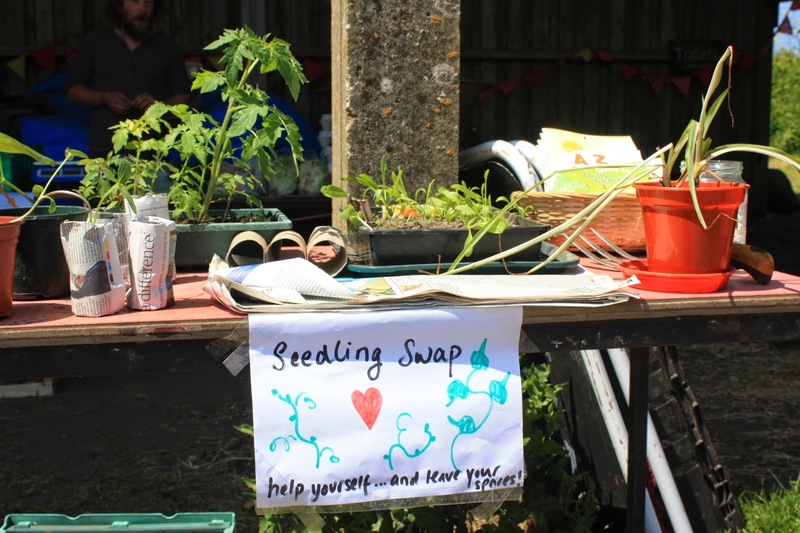 Slightly misleading title there, sorry, as the Sausage is the name of our long thin polytunnel, and the Friday before last we filled it with cucumber, pepper and aubergine seedlings (apart from our perennial physallis bed, which we have retained). 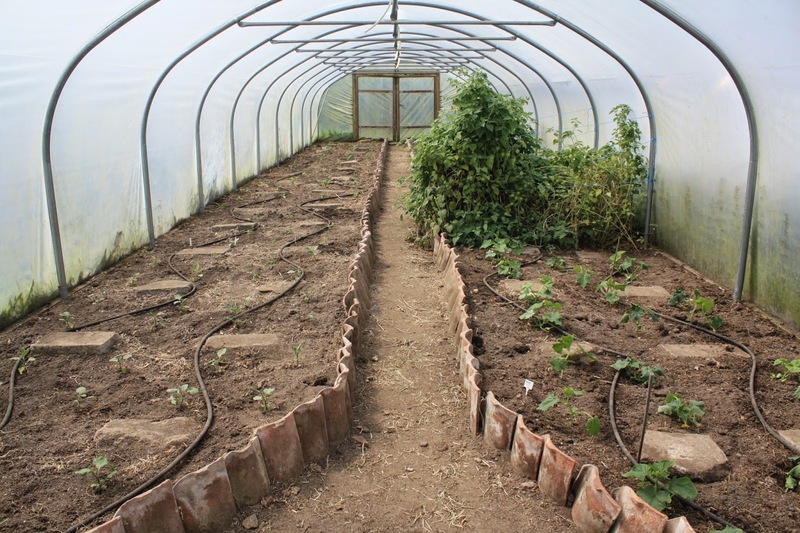 The tunnel was full of spent salad jungle, which the YMCA volunteers ripped out and composted for us, but 2 days later the tunnel was full again - ad we already have the first cucumber plants setting fruit. Janie and Pete planting cucumbers. Alice and Pete planting peppers and chillies. The Sausage fully planted for the summer. Many thanks to Alex, from the Basque region of Spain, who left yesterday morning after two and a half weeks as a wwoofer on the farm. 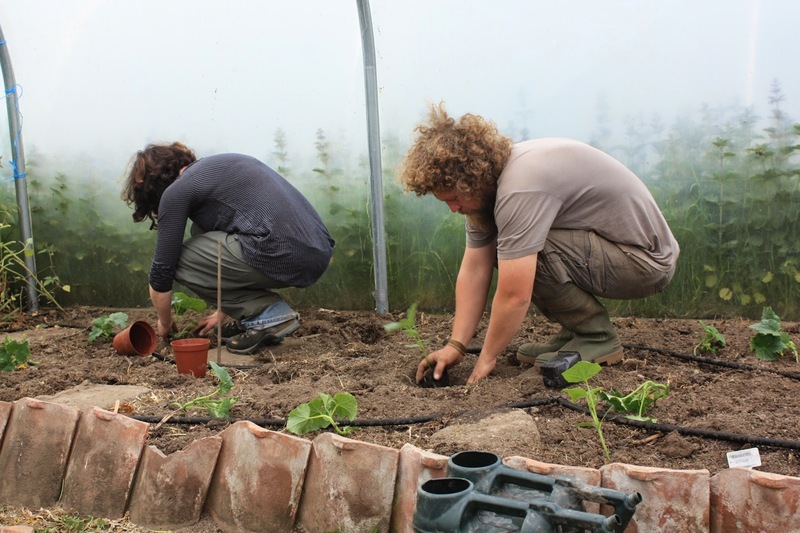 We hope your summer of wwoofing in the UK goes well. 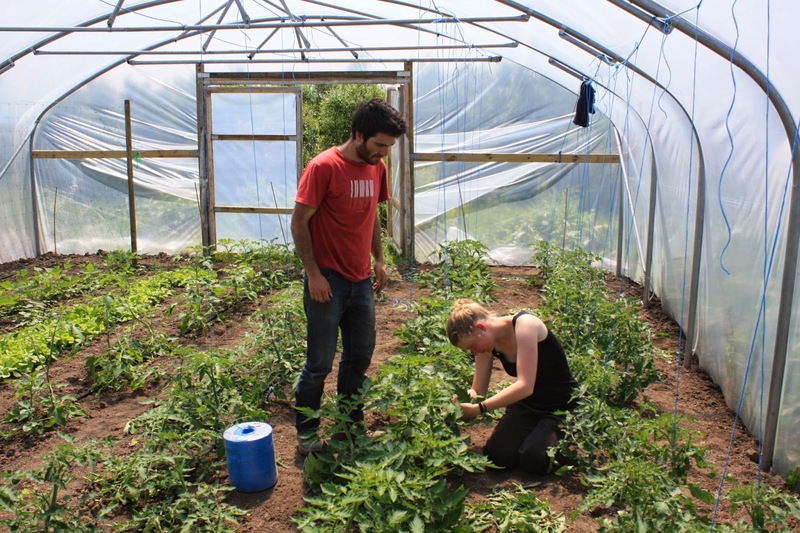 Alex on the left, helping Katya to string up tomatoes in Valentine 4th polytunnel.